Delaware County officials announce the filing of a lawsuit Thursday against 11 makers of opioid painkillers, hoping to stem the tide of drug deaths and overdoses. 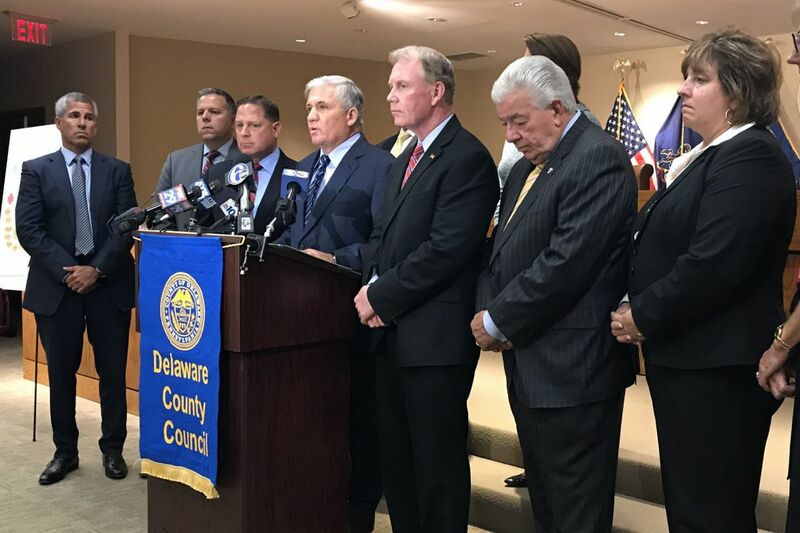 Delaware County has become the first county in Pennsylvania to sue manufacturers of addictive painkillers, joining a growing number of municipalities nationwide that have taken that step with the hope of stemming the deadly opioid epidemic. "There is only one thing that Big Pharma and big opioid manufacturers listen to and react to," said attorney Robert J. Mongeluzzi, "and that is money." While no amount of damages is specified in the suit, officials said the county wants to recoup tens of millions of dollars it has spent on treatment centers and medical services for addicted residents. The county said it could not provide an exact cost estimate at this time. As of Thursday, Delaware County had logged 145 opioid-related drug deaths since Jan. 1, authorities said, and police officers in the county had saved more than 877 lives using the overdose-reversing medication naloxone. District Attorney John J. Whelan announced the lawsuit against 11 drug manufacturers and their consulting doctors Thursday at the courthouse in Media. The suit was filed Thursday morning; Mongeluzzi will lead the county's legal team. "We are tired of looking in the eyes of parents that have lost children to this scourge so pharmaceuticals could make a buck," said Dave White, co-chair of the county's Heroin Task Force. "We are tired of going to funerals of children of our friends because pharmaceuticals are giving them medications they know are addictive." If Delaware County were to win this suit, officials said, they would use the award money to recoup those funds and invest in recovery programs for those battling addiction. "The opioid manufacturers in their relentless pursuit for profit created disinformation to hoodwink and convince doctors that opioids weren't addictive when they were," Mongeluzzi said, "and were efficient and worked when they don't." "We filed this lawsuit to get the Delaware County residents' money back," White said. "We have spent year after year after year fighting this addiction that [drug companies] have caused, and they have knowingly caused." Four of the biggest manufacturers and distributors of powerful prescription drugs are based in the Philadelphia area. Endo Pharmaceuticals, based in Malvern, makes Percocet and Opana ER, which the company voluntarily removed from the market in July at the request of the Food and Drug Administration. Johnson & Johnson's Janssen Pharmaceuticals of Titusville, N.J., makes the fentanyl patch Duragesic. Teva Pharmaceuticals USA, headquartered in North Wales, Montgomery County, owns Cephalon Inc., which makes a fentanyl "lollipop" called Actiq. And AmerisourceBergen of Chesterbrook, Chester County, is a national drug distributor. The manufacturers named in Delaware County's suit include Teva, Janssen, Endo, and the Stamford, Conn.-based Purdue Pharma, which makes pain medications including OxyContin. "While we vigorously deny the allegations, we share public officials' concerns about the opioid crisis," Purdue Pharma said in a statement, "and we are committed to working collaboratively to find solutions." The company went on to say it is "an industry leader in the development of abuse-deterrent technology, advocating for the use of prescription drug monitoring programs and supporting access to naloxone — all important components for combating the opioid crisis." Endo said in a statement that the company could not discuss any litigation, but shared "the FDA's goal of appropriately supporting the needs of patients with chronic pain while preventing misuse and diversion of opioid products." Teva and Janssen spokesmen could not be reached for comment. Across the country, more than two dozen states, counties, and towns have sued pharmaceutical firms in the last year for the costs the overdose crisis has imposed on their areas. Last month, Bensalem Township became the first Philadelphia-area municipality to announce its intent to sue opioid companies; it was unclear Thursday whether the Bucks County township suit has been filed. "In many of these instances, as you reach critical mass, these cases are consolidated together," Mongeluzzi said. "That doesn't necessarily mean that it is going to happen now." On Tuesday, the attorneys general in 41 states, including Pennsylvania and New Jersey, announced they were broadening their investigation into drug companies' role in the overdose epidemic, subpoenaing five manufacturers and demanding information from three distributors. In 2001, years before opioid addiction became a nationally recognized crisis, Richard G. Paolino, a Bensalem doctor, was charged with distributing hundreds of thousands of OxyContin tablets, often to patients with minor ailments or none. Paolino, now 74, was sentenced to 30 years in prison and remains at the Houtzdale Correctional Institution. In the last decade, drug overdose deaths have risen sharply. In 2016, an estimated 64,000 people died from overdoses in the United States, according to the Centers for Disease Control and Prevention, and more than 50,000 of those deaths involved opioids. On Friday, Lackawanna County in northeast Pennsylvania announced its intention to sue pharmaceutical companies in the coming weeks, noting that it would have been the first county in the state to do so. It retained a law firm on Wednesday, according to the Scranton Times-Tribune, but has yet to file the suit. Delaware County officials said they filed their suit around 8:30 a.m. Thursday, beginning a "war" against the opioid industry. Harris L. Pogust, a lawyer working on the suit, said he did not know of any similar lawsuits that had been successful, but county officials said they were confident theirs would be the first. "We're going to hold these pharmaceutical [companies] accountable," White said, "for every death they've incurred in Delaware County."